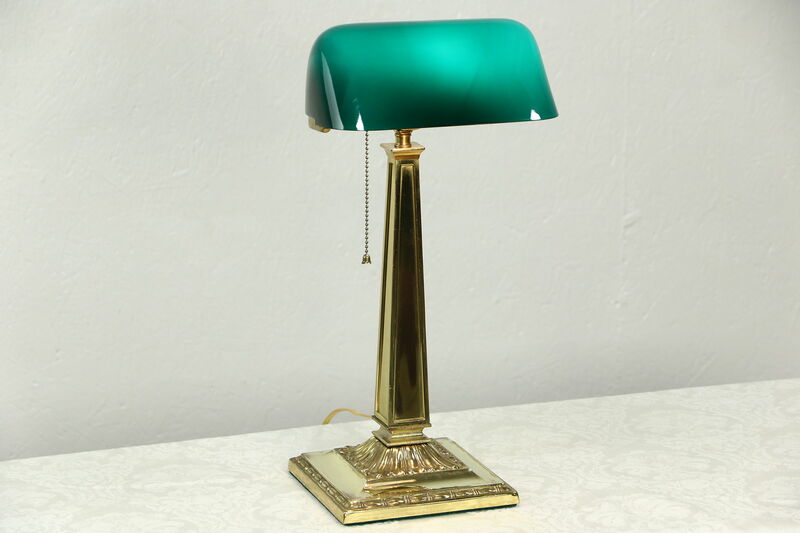 Signed by famous maker, "Emeralite, Aug 15, 1916, NY, USA," this marvelous "banker's" desk lamp has an original emerald green glass shade, the last PAT date on the arm is 7-10-17, see photos. To reflect light down onto paperwork, the interior of the blown shade was cased with a layer of opal white glass, the bottom edge was then ground and polished. There are minor flakes on this edge, see photos. An embossed brass weighted base has an adjustable angle and just enough wear for antique patina. The original standard base socket with pull chain switch has been rewired for safety.